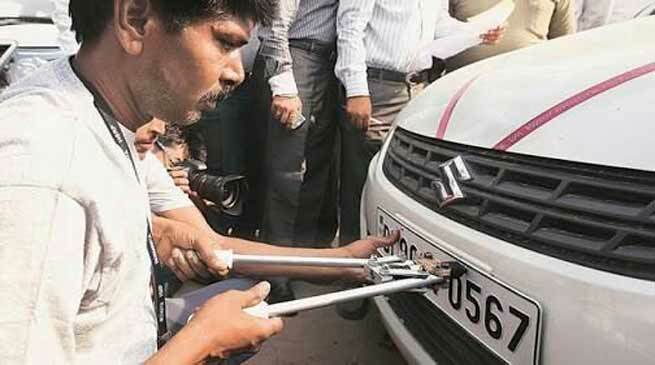 Hailakandi District Transport Office ( DTO ) of Assam has asked owners of old vehicles to install the High Security Registration Plates (HSRP) within a period of three months. District Transport Officer (DTO), Nripen Kalita said that all old vehicles must be fitted with HSRPs as per the ruling of the Supreme Court. Kalita said he has received a copy of the order from the Commissioner of Transport, Assam, directing him to take appropriate steps for timely conversion of old vehicles with new HSRPs. The DTO has asked owners of old vehicles to install HSRPs and the automobile dealers declared as special registering authority and concessionaire of HSRPs for its expeditious implementation. Official sources said tamper-proof HSRPs in vehicles help in tracing out vehicles should they violate traffic rules and regulations and flee after being involved in road accidents. The tamper-proof HSRPs also help to curb the incidents of vehicle thefts. The HSRPs have a non-replicable chromium hologram with a chakra image sticker having the engine and chassis number. The rear registration plate is fitted with a non-reusable snap lock so that if it is forcibly removed, the lock will break and that would clearly show the number plate has been tampered with. The apex court had in 2012 asked several states and Union Territories to ensure high security registration plates for all vehicles by June 15 that year or face contempt of court proceedings. The apex court had said that installation of HSRP is statutory command which is not only in the interest of the security of the State, but also serves a much larger public interest. “Therefore, it is not only desirable, but mandatory, for every state to comply with the statutory provisions/orders of this court in terms of Article 129 of the Constitution of India, 1950,” the apex court had said in its order. It had directed that all states, to fully implement the scheme of fixation of HSRPs positively by April 30, 2012 for new vehicles and by June 15, 2015 for old vehicles. The court had warned that no state will be allowed any further extension of time for implementation of this direction and failure to comply with its direction will lead to contempt proceedings against the “Secretary (Transport)/Commissioner, State Transport Authority and/or any other concerned person or authority under the Contempt of Courts Act, 1971. The Supreme Court heard on a contempt plea (C) No.1787/2017 in WP(C) No.510/2005 alleging non-compliance of its order related to ensuring high-security registration plates for all vehicles on May 1 last. The apex court also had heard a contempt plea on August 8 last year. The next hearing of hearing is slated for first week of July.